Patrick T. Sheehan saved my life. I had not filed a tax return for 11 years and I had resolved to kill myself if the IRS ever caught up to me. Thank God, I found Patrick T. Sheehan! The first time that I ever met him, I was terrified. He listened carefully to my story, took copious notes (which he always does!) and assured me that he could help, never making any promises that he could not keep. He referred me to an accountant to get the unfiled tax returns prepared and afterward, his office filed those returns for me. After the IRS assessed the total liability, with Patrick T. Sheehan’s guidance, wise counsel and some pre-offer planning, we submitted an Offer in Compromise to the IRS, which was initially rejected but ultimately accepted. Your “mileage” may vary, but Patrick T. Sheehan settled my IRS tax liability for a little more than 1 percent of the total amount due! Patrick T. Sheehan and his associates are the model of professionalism and are experts at what they do. They do not make promises that they cannot keep and are extraordinary with follow up and thoroughness. They are extremely careful to explain all of the available options and the pros and cons of each. Their invoices are as detailed as I have ever seen and, frankly, I have never been happier to pay an attorney’s bill! I paid Patrick T. Sheehan more than I paid the IRS, but what I received in exchange was priceless! I cannot recommend Patrick T. Sheehan highly enough! I trust him with my life! Patrick T. Sheehan and Associates is now working on the resolution of my remaining tax issues with the Illinois Department of Revenue and, so far, everything looks optimistic. Our taxpayer had not filed tax returns with the IRS or the Illinois Department of Revenue for many years. We worked with the taxpayer to prepare honest and accurate tax returns for all of the unfiled years and filed them with the IRS. 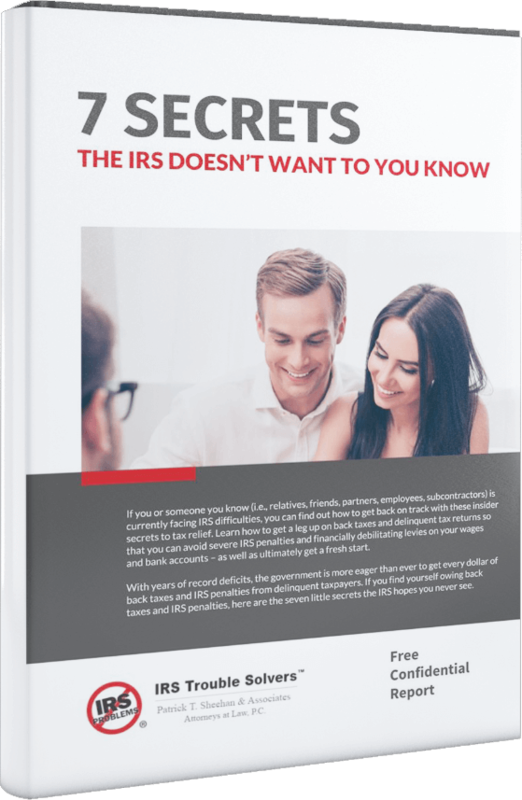 Not surprisingly, with penalties and interest, the balance due to the IRS was nearly $400,000.00. We prepared and filed an Offer in Compromise on behalf of our taxpayer and filed it with the IRS. Although the IRS initially rejected the Offer in Compromise, we persevered and ultimately obtained an Offer on behalf of our taxpayer in the approximate amount of $3,600.00, which represented about one percent of the total balance due. We are currently working with our taxpayer to resolve his Illinois Department of Revenue matters.